DARKE COUNTY – Two Greenville sophomores who are quickly rising and a Versailles senior who finished off a great career are The Daily Advocate’s athletes of the year for their respective sports. 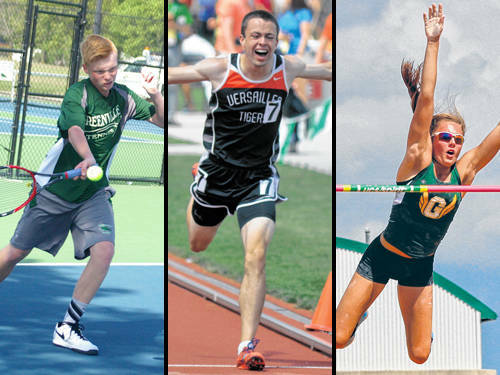 Greenville’s Branson Leigeber is The Daily Advocate’s boys tennis player of the year, Greenville’s Riley Hunt is The Daily Advocate’s girls track and field athlete of the year, and Versailles’ Joe Spitzer is The Daily Advocate’s boys track and field athlete of the year. Spitzer won the state championship in the Division II boys 3,200 meter run at the Ohio High School Athletic Association state track and field meet. His time of 9:14.97 was more than seven seconds faster than anyone in the Division II race. Spitzer also qualified for state in the 1,600 meter run but scratched in that race to better his chances in the 3,200. The Versailles senior was the fastest Darke County runner in the 1,600 meters (4:27.66) and 3,200 meters (9:14.97) this year. He was the second fastest in the 800 meters (2:00.88). This summer Spitzer, a future Liberty University runner, also won the 2 mile race at the Emerging Elite Division at New Balance Nationals Outdoor with his time of 9:24.06. He finished fourth in the 3,200 meters at the Midwest Meet of Champions. Hunt made the podium in the Division I girls pole vault at the OHSAA state track and field meet. She cleared 11 feet 6 inches and finished sixth in the state. “Even though we didn’t end like we wanted to at the state meet, she still got on the podium,” Greenville pole vault coach Micah Coblentz said. Hunt led all Darke County girls in the pole vault this season as she cleared 13 feet during the OHSAA district meet at Piqua. “Things really started clicking for her,” Coblentz said. Last year Hunt’s personal best was only 10 feet, Coblentz said, but then she started to quickly improve. She started this year at 11 feet 6 inches and kept pushing her personal best even higher. The Lady Wave sophomore set a school record at Versailles’ Stillwater Valley Invitational when she cleared 12 feet 7 inches. Before the OHSAA season began, Hunt won the Ohio Association of Track-Cross Country Coaches Indoor State Championship in the girls pole vault. Hunt isn’t just one of the best in Ohio. Her PR of 13 feet is tied for the best among high school sophomores in the entire country. Coblentz thinks Hunt is capable of setting Ohio’s state record in the next couple years and becoming the first girl from the Buckeye State to clear 14 feet. Hunt is continually striving to get better. After playing third singles as a freshman, Leigeber was Greenville’s No. 1 singles player throughout the 2018 season. The Greenville sophomore went 5-5 in Greater Western Ohio Conference play this season. With Leigeber leading the way, Greenville finished the 2018 season with a winning record at 11-7. Leigeber teamed up with Landon Muhlenkamp during the OHSAA postseason this year. The duo fell one win shy of advancing to the OHSAA district tournament in doubles play. This entry was tagged Athlete of the year, Athletes, Athletes of the year, Greenville, GWOC, MAC, MVPs, Player of the year, Players of the year, Tennis, Track, Track and field, Versailles. Bookmark the permalink.